Go roamin' round the cyber range with America's Favorite Singing Cowboy protecting your mouse. 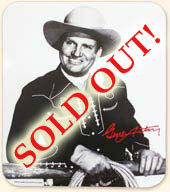 This mouse pad features a handsome black and white glossy photo of Gene Autry with reproduction signature in red. There's no better way to surf the web than with Gene by your side.